The dosage is based on your medical condition and response to treatment. Take this medication regularly to get the most benefit from it. What conditions does Provigil treat? Tell your doctor right away if you have any serious side effects, including: fast/pounding/irregular heartbeat, mental/mood changes (such as agitation, confusion, depression, hallucinations, rare thoughts of suicide). Get medical help right away if you have any very serious side effects, including: chest pain. 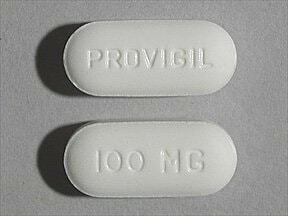 List Provigil side effects by likelihood and severity. Before taking modafinil, tell your doctor or pharmacist if you are allergic to it; or to armodafinil; or if you have any other allergies. This product may contain inactive ingredients, which can cause allergic reactions or other problems. Talk to your pharmacist for more details. Before using this medication, tell your doctor or pharmacist your medical history, especially of: heart problems (such as enlarged heart, mitral valve problem, chest pain, heart attack, irregular heartbeat), heart problems after taking stimulant drugs such as amphetamines (including chest pain, irregular heartbeat), high blood pressure, liver problems, mental/mood disorders (such as depression, mania, psychosis), personal or family history of a substance use disorder (such as overuse of or addiction to drugs/alcohol). Sleep disorders may reduce your ability to react quickly. Though modafinil helps keep you awake, you still may not be able to safely do things that require quick reactions (such as driving). This drug may also make you dizzy. Alcohol or marijuana can make you more dizzy. Do not drive, use machinery, or do anything that needs alertness until you can do it safely. Avoid alcoholic beverages. Talk to your doctor if you are using marijuana. What should I know regarding pregnancy, nursing and administering Provigil to children or the elderly? Some products that may interact with this drug include: street drugs (such as methamphetamine, MDMA/"ecstasy"). This medication may decrease the effectiveness of hormonal birth control such as pills, patch, or ring. This could cause pregnancy. Discuss with your doctor or pharmacist if you should use additional reliable birth control methods while using this medication and for 1 month after stopping this medication. Also tell your doctor if you have any new spotting or breakthrough bleeding, because these may be signs that your birth control is not working well. Modafinil can speed up the removal of other medications from your body, which may affect how they work. Examples of affected drugs include axitinib, bosutinib, certain products used to treat chronic hepatitis C (asunaprevir, ombitasvir/paritaprevir/ritonavir), among others. Modafinil is very similar to armodafinil. Do not take medications containing armodafinil while using modafinil. If someone has overdosed and has serious symptoms such as passing out or trouble breathing, call 911. Otherwise, call a poison control center right away. US residents can call their local poison control center at 1-800-222-1222. Canada residents can call a provincial poison control center. Symptoms of overdose include: fast/irregular heartbeat, severe restlessness, hallucinations. Laboratory and/or medical tests (such as blood pressure, heart rate) may be performed periodically to monitor your progress or check for side effects. Consult your doctor for more details. Follow good sleep habits (such as sleeping in a dark/quiet room, avoiding caffeine close to bedtime) which can help improve your sleep if you have shift work sleep disorder. If you miss a dose, take it as soon as you remember. If it is near the time of the next dose, skip themissed dose and resume your usual dosing schedule. Do not double the dose to catch up. Do not take missed doses close to bedtime because doing so may make it harder to go to sleep. 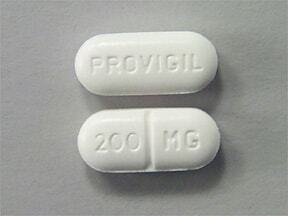 This medicine is a white, oblong, scored, tablet imprinted with "PROVIGIL" and "200 MG". This medicine is a white, oblong, tablet imprinted with "PROVIGIL" and "100 MG". Are you considering switching to Provigil? How long have you been taking Provigil?